Pianist Colin Purbrook was born in Seaford, Sussex in 1936. His father was a professional pianist and Purbrook began taking piano lessons when he was six. He won three Challenge Cups at the Brighton Music Festival of 1947 and went on to read music at Fitzwilliam College, Cambridge. In 1957 he first joined Sandy Brown's quintet on double bass, working with it for a six-month season and played piano in the Sandy Brown-Al Fairweather All Stars, staying for three years whilst also working with other bands. One of these was Kenny Ball's, where Purbrook played trumpet, piano and bass. But his interests lay in modern jazz, and he played mainly with the Allan Ganley-Ronnie Ross Jazzmakers and toured in Germany with the band led by trumpeter Bert Courtley in 1961. He also co-led a quintet with Tony Coe. He joined Charlie Mingus, Dave Brubeck, Tubby Hayes and other musicians in another Rank film, All Night Long in 1961. After more touring with Kenny Baker in 1962 and work with Tubby Hayes, Purbrook joined Dudley Moore's Trio on bass, and continued the association by leading the trio on piano for the Beyond the Fringe stage show that starred Moore and Peter Cook. Purbrook was on piano for BBC 2's jazz series 625 with Dakota Staton and the Keith Christie All Stars respectively and was a member of Benny Goodman's sextet when the clarinettist recorded a special gala performance for BBC2 in 1964. He joined tenor player Don Rendell the same year, and stayed for another two years when the band became the Don Rendell-Ian Carr Quintet, and had an important role in the group's now legendary album Shades of Blue. In subsequent years he worked most frequently with Sandy Brown and Tony Coe and with his own quartet and octet. As they became aware of the quality of his piano accompaniment, many visiting Americans asked for him, and he played for Benny Carter, Chet Baker, Buddy Tate, Zoot Sims, Mark Murphy, the Roy Eldridge Quintet, Annie Ross, Dexter Gordon, Ruby Braff, Howard McGhee, James Moody and others. He was a member of Ronnie Scott / Jimmy Deuchar Quintet in 1960 and when the Ronnie Scott Club opened often worked there as pianist. He played in the Tony Coe / John Picard Quintet from 1965 to '66. He chose, whenever he could, to play with the drummer Phil Seamen, whose work he particularly admired, and he joined Seamen's Trio during the late 1960s and early '70s. In 1972 he joined the Humphrey Lyttelton band and stayed for three years. Purbrook then worked in the theatre for many high profile musical productions includin Bubbling Brown Sugar (1977), One Mo Time (1981) and Lady Day (1987) as well as film work but was often in demand to back vocalists or as a solo pianist, and he became an automatic choice in the Eighties to accompany visiting jazz stars, and often recorded with them for the BBC. They included Kenny Davern, Warren Vache, Benny Waters, Teddy Edwards, Scott Hamilton, Sonny Costanzo, Al Cohn, Harry Edison, Plas Johnson, Doc Cheatham, Harold Ashby, Dusk Goykovich, Ken Peplowski, Bobby Shew, Bill Berry, Eddie "Lockjaw" Davis, Herb Ellis, Barney Kessel and many others. In 1990 he became resident solo pianist at L'Escargot Restaurant in Soho, London, and later had the same role at Kettner's. During the Nineties he continued to tour and appear on radio and television and, despite the fact that in 1995 he began to suffer from rheumatoid arthritis. Despite major surgery and chemotherapy for cancer that developed in late 1997, he remained able to play until the end of 1998. Purbrook was a talented musician and although he played piano for most of his career he also worked regularly on double bass, and was adept on cornet, trombone and clarinet. He died in London in February, 1999. 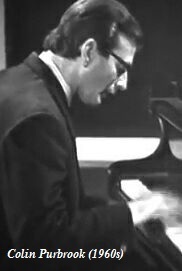 Humphrey Lyttelton commented: "The most notable thing about him, and the reason that any musician would like to play with him, was primarily his touch on the piano. It was the most beautiful touch, light as air, and his solos floated. But apart from that, his interjecting of chords or harmony into other people's solos, would make most of those musicians say that he was the best accompanist in the business." Tubby Hayes (ts, fl), Victor Feldman (p), Jeff Clyne (b), Bill Eyden (d). There Is No Greater Love*. Tubby Hayes (ts, fl), Stan Tracey (p), Kenny Napper (b), Jackie Dougan (d). Bert Courtley (tp), Keith Christie (tb), Johnny Scott (as,f), Tubby Hayes (ts), Colin Purbrook (p), Ray Dempsey (g), Kenny Napper (b), Allan Ganley (d). Scott Free*/Dedication to Johnny Hodges*. Johnny Scott (as,f), Tubby Hayes (ts), Colin Purbrook (p). Bert Courtley, Stan Roderick, Tommy McQuater, Derrick Abbott (tp), Keith Christie, Jack Armstrong, L.Clarke, J.Irvin (tb), Johnny Scott (as,f), Damian Robinson (as), Tubby Hayes, Keith Bird (ts), Ronnie Ross (bs), Colin Purbrook (p), Ray Dempsey (g), Kenny Napper (b), Allan Ganley (d), Phil Green (arr). Bert Courtley, Stan Roderick, Ray Davies, Derrick Abbott (tp), Keith Christie, Don Lusher, Wally Smith, Ken Goldie (tb), Johnny Scott (as,f), Damian Robinson (as), Tubby Hayes, Keith Bird (ts), Ronnie Ross (bs), Colin Purbrook (p), Ray Dempsey (g), Kenny Napper (b), Allan Ganley (d), Phil Green (arr). Freddie Clayton, Bert Courtley, Stan Roderick, Tommy McQuater (tp), Keith Christie, Jack Armstrong, L.Clarke, J.Irvin (tb), Johnny Scott (as,f), Damian Robinson (as), Tubby Hayes, F.Reidy, Phil Goodie (saxes), Ronnie Ross (bs), Colin Purbrook (p), Ray Dempsey (g), Kenny Napper (b), Allan Ganley, S. Whittaker (d), Phil Green (arr). As above + Jack Constanzo (bgo). Tony Coe (cl), Colin Purbrook (p), Lenny Bush (b), Lennie Hastings (d). Love For Sale*/Time's A Wastin'/Satin Doll/Sweet Georgia Brown. Tony Coe (cl,as,ts), John Picard (tb), Colin Purbrook (p), Spike Heatley (b), Derek Hogg (d). Gee Baby Ain't I Good To You/Hanid. Sunday Morning/Wrap Your Troubles In Dreams/Not So Blue/I Can't Get Started/Sack O'Woe/Stomping At The Savoy/Swingin' Till The Girls Come Home/BlueLou/St. Thomas. Ian Carr (tp,fl-hrn), Don Rendell (ts,sop), Colin Purbrook (p), Dave Green (b), Trevor Tomkins (d). Blue Mosque*/Latin Blue*/Sailin'*/Garrison '64*/Blue Doom*/Shades Of Blue*/Big City Strut*. Tony Coe (cl,as,ts), John Picard (tb), Colin Purbrook (p), Peter Ind (b), Jackie Dougan (d). Peter King (as), Colin Purbrook (p), Dave Green (b), Allan Ganley (d). Confirmation*/Chatelet*/Star Eyes*/Blues For Buddy*/Lush Life*/Good Bait*. Colin Purbrook (p), Colin Oxley (g), Andrew Cleyndert (b). Peau Douce*/Brazilian Dance No.2*/I Can't Get Started*/You'd Be So Nice to Come Home To*/My Ideal*/Django*/I Fall In Love Too Easily*/Golden Earrings*/Marajuana*/Bernie's Blues*. Bobby Wellins (ts), Colin Purbrook (p), Dave Green (b), Clark Tracey (d). I'm A Fool To Want You*/For Heaven's Sake*/You Don't Know What Love Is*/I Get Along Without You Very Well*/For All We Know*/Violets For Your Furs*/You've Changed*/It's Easy To Remember*/But Beautiful*/Glad To Be Unhappy*/I'll Be Around*/The End Of A Love Affair*. This page was last updated during February, 2015.